I can tell Spring is really here despite the cold (actually freezing) mornings and the rain. My allergies are on a different level this year. I do not approve. It’s Easter weekend. When I was very young this meant a new Easter outfit. We’re talking the full enchilada – dress, shoes, gloves, and a HAT!!! This also meant going to an extra long Easter Sunday service but usually the coffee hour after (Methodists don’t play) was outstanding. Like many of our other traditions, this one ended once we moved to the suburbs. I know one reason was because I was getting older and nobody really dressed up for Easter in our suburb after a certain age. Another reason for the change was cultural. Our church in Verona was the complete opposite of our church in New York City. Very few people in our town would wear an Aretha Franklin type hat to church. In the mid 70’s my parents’ friends and relatives starting fleeing the economically devastated and crime ridden City. Everyone was so spread out. No longer could we walk, take a cab, or just hop on the subway to visit. Now there were long car rides to Westchester County, Long Island, Bergen County, etc. Occasionally, we did make it back into the City. 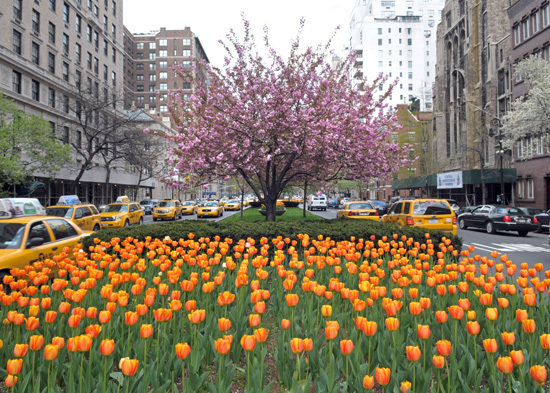 One of my favorite signs of Spring were the tulips on Park Avenue. Years later, after college and career number one, I finally made it back to my hometown and would walk up Park as soon as the tulips were in bloom. Recently I’ve become much more nostalgic during the holidays. I think it’s because I live so far away from my family. My siblings now have their own traditions with their families and I don’t. The forecast calls for rain tomorrow. I will buy some tulips. Isn’t it? The NYC Parks and Recreation website is fantastic. Since moving to Italy I’ve returned to Los Angeles for meetings. I know the city has changed a lot since I moved over fifteen years ago but I really need to visit soon. I will be in NY in a couple of days. Haven’t been in five years. Will report back! I read your report. Glad to see you had a great trip. Nice to find your blog and I had very traditional parents growing up so I had to wear full-blown Easter dresses too-church hats, fancy shoes et al! I miss some of those hats.